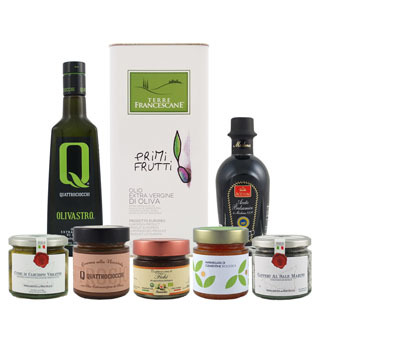 AGRARIA RIVA DEL GARDA PEPERO: Peperò, the brand new extra virgin olive oil and chili pepper condiment developed by Agraria Riva del Garda has arrived! Locally grown olives are hand-harvested and crushed with a mix of chilies with varying degrees of spiciness and aromas cultivated in Trentino by the organic farm "Trentino Peperoncino". The resulting oil is brilliant amber in color with an elegant and complex scent of green herbs and almonds from the olives, and vegetable and peppercorns from chilies. The spiciness is present and persistent yet incredibly pleasing. Try drizzling over vegetables, pizza, tomato pastas and grilled meats for an extra bit of heat. OLIO GUGLIELMI CRUSHED CHILI PEPPER: this spicy red chili pepper extra virgin olive oil, made with natural flavorings and no artificial additives, is infused with their highest quality extra virgin olive oil for superior flavor and is perfect for adding some heat to your next meal. Try this oil drizzled over pizza, pastas, Asian noodles or anything else that needs a little fiery kick. CRETAN TASTE HOT PEPPER: Pressed from Koroneiki olives, this extra virgin olive oil is mixed with hot peppers and spices which give the oil a medium hot, spicy flavor. The special mixture is based on a traditional Greek recipe dating back to ancient times. This oil is fantastic when drizzled on pizza, pasta and bean soups. For the more adventurous, try mixing it in with your favorite chocolate dessert for an added spicy kick! OLIO DE CARLO CRUSHED PEPERONCINO: From renowned Puglian producer, Olio De Carlo, this stone-crushed peperoncino extra virgin olive oil is made by milling hand-picked Coratina and Ogliarola olives simultaneously with peperoncino chili peppers. The resulting oil is incredibly aromatic and truly natural in flavor. Try drizzled over tomato pasta, grilled meats, in sauces or over wood-oven pizza. BASIRICO PEPERONCINO: An extra virgin olive oil naturally flavored with red chili pepper. Give some heat to your next dish to take it to the next level.